sometimes it is super hard to get my kids to get enough green goodies into their daily diet. do you have that problem? i looked into juicing and am crazy impressed with you mommies that do it--you rock--but it just isn't for me right now. low and behold, when i was at my favorite place on the planet, trader joes i came across this "green plant juice". it wasn't expensive and is just was just what i was looking for so i though i would give it a try. it looked a little intimidating to me and i wasn't sure the kids would go for it but they LOVE it! my favorite use for it is in smoothies. put frozen strawberries, frozen pineapple, a banana or two, a handful of baby spinach and a bunch of this green juice, give it a whirl in the blender (i use the ninja) and it turns into an awesome smoothie! i am not even a big veggie connoisseur and i LOVE this smoothie. you can't even taste the greens! it's fantastic! 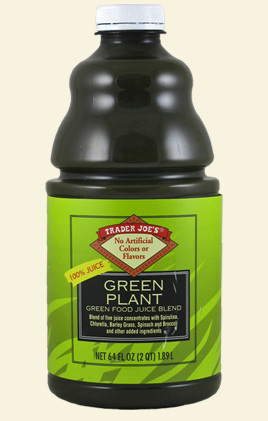 you might want to do yourself a favor and give trader joe's green plant juice a try.....who knows, maybe your kids will beg for it too! ?